Time for some calm water and big Dolphin in Key West. We seem to maybe, just maybe, starting to have some calm summer weather in Key West. The fishing is even better than the weather with big 20+ pound fish on almost every trip and much bigger occasionally. And if you want to be a little closer to the action, come join us. I wish I had a shot of this fish that’s really tearing up the deck and I don/t think our angler wants to get much closer at this point. Special mention on the particularly smooth gaffing today. It’s summer of 2017 and the heat is really starting to add up. Water temperatures in the 90’s have helped build a lot of afternoon rain and thunderstorms in Key West this summer. We have had a couple of exciting rides home this summer, can’t say we really dodged lightning but we didn’t catch either. Thank Goodness. The warm water has put a lot of fishing deeper too where the Gulfstream water is cooler than the nearshore waters. The Dolphin fishing has been disappointing this summer and all good catches have been around debris that you found first. Fortunately the combination of slow Dolphin and hot Snapper fishing on the reef has kept a lot of fishermen nearshore, and when you do venture deep the competition is not so heavy. The Snapper fishing has been solid with really great catches of Yellowtail , Mangrove and Mutton Snapper all up and down the reef , get some chum ,some secret numbers and catch a bunch of nice fish. This pattern should remain for the rest of the Summer. Good snapper fishing on the reef , spotty Dolphin fishing on first found debris and a few Wahoo and Marlin to liven up the troll. Swordfishing at night has been productive around the full moons as the squid come to the surface at night. As bycatch of the Swordfish we have gotten big Blackfin Tuna at night while drifting for the Swords. Night fishing is not just for Swords , on the reef the Snapper bite is hot at night , and the temperature is much cooler. I always thought when I got older that reflection of accomplishments and successes would be the stuff on my mind. Although I do relive some of those from time to time, the dominant is the one that got away. The fight well fought and lost. The passion lingers in those moments where the winners are complete and there is nothing left to do. I still hunger to complete those battles. Several years ago when recreational anglers here in Key West figured out they could catch Swordfish I got the bug. I started going after Swords whenever I could. Night fishing was all we were doing then and we were having good success, with keeper size fish on almost every trip. One of our first “loses” was a nice evening and we had a lot of life going on in the lights. The Squid and flying fish were all around the back of the boat and all kinds of bait at the edge of the light. It wasn’t long till we had a Swordie chasing flying fish behind the boat. Earlier in the charter we were fishing Mutton snapper and the only rod ready and available was a spinner used for Muttons. The forty pound three foot leader was not the perfect setup for pitching a Goggle Eye. Steve Stearns, my mate, could not stand to not take a shot and pitched the bait. It took three big splashing pitches to attract his attention, but once we got his attention nothing else existed. Now we were getting a real good look as he chased the bait around behind the boat batting at it with that “sword”. He was in the 125 pound class and took about five minutes before he actually killed the bait and ate it. This battle had no hope with a short under classed leader and a 20 pound spinner. The hook up was solid and the fish almost spooled the spinner on his first run. Steve worked the fish in to watch him take off and almost spool again and again over the next hour. Slowly the fish started taking less line on his runs and finally discovered he could sit about 30 feet behind the boat and we could not move him. We would back up and he would swim off . Bring him back but no closer than 25 – 30 feet. This standoff, out of gaff and harpoon range went on for a while until the inevitable line break. He had chaffed through the forty pound leader. What a surprise. Needless to say we keep a proper pitch rod always on the ready now. April is one of the best months for fishing in Key West. The sail-fishing is outstanding as evidenced by the tremendous catches racked up in the World Sailfish Tournament over the last several years. This tournament has grown to the premiere Sailfish tournament in the world because the sail-fishing in Key West in April is that good. Live baits drifted on the color change are preferred, but a well rigged Ballyhoo swimming naked on light fluorocarbon leader will raise fish too . Teasers work well and there is no end of different methods from simple squid chains and strip teasers to dredges that take half a day to rig. But , sail-fishing is not the only hot fishing going on . In the last half of April the really big slammer Dolphin will start migrating through Key West waters heading west. 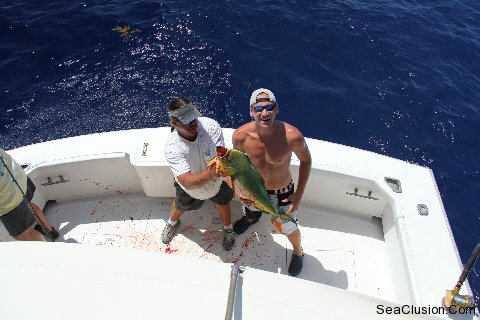 Find birds working west and troll in front of them for shots on thirty and forty pound Dolphin. Larger Dolphin will be caught but fishing all day can expect to land one in the thirty to forty pond range. This is not when you leave one in the water to keep the school close. You get shots while landing a fish but these fish are heading west in groups of three to four fish. With the strong east current just land one and try to get back to the birds. Some of the best fish of the year will be caught this month and next. I like trolling blue and white skirted Ballyhoo because the imitate flying fish however Dolphin are well known for eating anything. I live bait will coax a big bull when he is already stuffed. And if that is not enough Tarpon will be invading the harbor in huge numbers and on the Full Moon some of the snappers will start to spawn. All in all some of the best fishing of the year is coming this month. So get out and enjoy the action and take your kids too they will remember these catches for a lifetime..
Wow! That is about the best way to describe the fishing in Key West right now. Sailfish have been plentiful , along with Blackfin Tuna, Bonitas (I don’t care what they taste like – they fight like crazy) Amber Jacks on the wrecks, small dolphin and now today Large Dolphin are starting to move into our waters. All of these fish continue in the near Gulfstream waters and as conditions last make for fantastic charters. The kite gets the Sails one day and then they bite trolled Ballyhoo the next. Tuna really like Pilchards and the Bonita and Dolphin will eat everything. Truly a great time for charters fishing in Key West! Fishing with new friends JR and Ginger and old friend Kevin (Foggy) on a very special day catching Wahoo and Tuna. Calm seas and a gentle breeze made for an exceptional day on the water. Mate Steven jigged up Tunas from 350′ and put on a great display of angling. JR got his first blue water fish in Key West with a reel screaming Wahoo. JR was so enthused by that catch he decided to go for a pallet later in the day. I hope he wasn’t upset when I declined to boat his catch. March is upon us and the fishing is starting to change away from the winter fish predominated by Kingfish and changing to more Sailfish. Tuna are still strong and Cero Mackerel on the reef can make a day. The big thing about March it’s all about live bait. Big Razor Belly Pilchards are the #1 choice and if you don’t know how to catch them then break out the wallet , because that is your ticket to the big fight. Thread Fin Herring and Goggle Eyes are good substitutes , however Goggle Eyes work best on a kite. The Sails are going to be tailing and to miss out on that action is a crime. Throwing a bait to a couple of Sails and watching them fight over who eats is probably as close to angler heaven as I am going to get. Cobia, Tuna, and Bonita are going to be thick in the mix along color changes. A few Hammerheads and Whalesharks will make there way along the color change too. This all sounds too easy and when you are in the right spot it is. Location is important and the location moves fast. The conditions brought about by wind and Gulfstream occur for us here in Key West between Cosgrove Light and Looe Key which is a considerable amount of territory. Some venture even further west on the fast boats. These conditions can run the entire reef line at times and those are glorious days, but most of the time it will be a piece of the current and the productive area may only run a mile or two. This is when you need friends and trust me don’t believe anything you hear on channel 8. And I cannot talk about March without saying in like a Lamb and out like a Lion. It is going to blow, just remember the harder it blows the better the bite. Be safe and catch a trophy! All grouper fishing around Key West will be closed from January 1 till April 30. Charters are booking fast for the last two weeks of December, and the grouper bite has been exceptional. We have been catching them on deep plugs, trolling deep , Live bait on heavy “digger” rigs and even as bycatch while drifting live ballyhoo for sailfish on top of the reef. So if you love Grouper book your charter fast ’cause it is going to be a long time till you get ’em fresh again. After being bumped from a flight by a well known ( but unnamed) carrier and driving all night to get to Key West to go fishing at 7:00 in the morning, our intrepid charter was greeted with 25 knot winds out of the Northeast. Fortunately the strong Westward current kept the seas reasonable and the fishing and napping took off. With tons of live Pilchards we decided to load up on flag Yellowtails to get things going. Oh well that strong current that was keeping the seas down was also keeping our bait on top and being eaten by razor tooth Mackerels. Several Sailfish reports were on the charter boat radio channel so we started trolling naked Ballyhoo . We were trolling about 20 minutes and missed our first Sailfish, another 20 minutes and we hooked and fought to the boat two Sailfish at once. These were both released and everyone was awake for a change. With success we continued the troll and added deep diving plugs and started catching nice Groupers along the top of the reef. As the day progressed the wind laid down and we ended up with a great day of fishing in Key West. Nothing like the thrill of your first Sailfish. Key West or anywhere the thrill is huge. We were actually trying to catch Dolphin and we weren’t staying busy doing that . Sounded like other boats were finding Sailfish on the way in , so we moved in closer and right away got one out of two in the baits . A few minutes after release we had another Sail check out the baits , but I guess Ballyhoo was not what he wanted. Glad we didn’t set out to Sailfish we probably would have to fight off the Dolphin. The last couple of months has found the best deep sea fishing on the reef, over wrecks and around rock piles. The current has run West and the prevailing east wind has made for a lot of good Snapper fishing. The Grouper seem to know we can’t keep em and have been biting fearlessly.Most days we fly a kite and pick up Kingfish, Cerro and Bonitos. With the last of winter in Key West we start getting the “WIND” although it will be rough on and off over the next couple of months the fishing for offshore pelagics is going to pick up tremendously. Sailfish are being caught regularly by those who are trying . Dolphin aren’t far behind . And if the wind is a little calm a wahoo around the full moon won’t be a surprise. The season has been strong and Key West deep sea fishing has been strong, so we are looking forward to the seasonal fishing picking up. Hi, this is Capt. Chuck Butler with Charter SeaClusion, operating out of Key West Oceanside Marina, where we offer a variety of deep-sea fishing charters aboard my forty-six foot Bertram sportfish “Sea Clusion”. June is the biggest month for fishing in Key West. School is out and families from Florida and afar come to Key West for fishing. There is no wonder why, the Dolphin migration is in full swing. Large schools of Mahi are passing through our waters and making for great catches and great memories. Finding Dolphin is more like hunting. The Dorados must be tracked down. Birds are the easiest way to spot the fish below. Erratic low level flight patterns are almost a sure sign of fish. Catching them then becomes the next challenge. It can break your heart when that big bull has eyes for flying fish only. Weed lines are always a great place to fish , but if you don’t get up real early your early bird neighbor may have already worked that line over. Any piece of floating debris is a fish magnet and should be fished thoroughly before being left behind. Trolling past a pallet is just the start, if fish are not hooked up on the first couple of passes, try a live bait. If the debris is holding a lot of bait break out the vertical jigs and drop em deep. We try to get down 250 – 300 feet with great results including Cobia in 750 feet of water in the middle of June. As we start the month of August the heat is really starting to add up. Water temperatures in the 90’s have helped build a lot of afternoon rain and thunderstorms in Key West this summer. We have had a couple of exciting rides home this summer, can’t say we really dodged lightning but we didn’t catch either. Thank Goodness. The warm water has put a lot of fishing deeper too where the Gulfstream water is cooler than the nearshore waters. The Dolphin fishing has been disappointing this summer and all good catches have been around debris that you found first. Fortunately the combination of slow Dolphin and hot Snapper fishing on the reef has kept a lot of fishermen nearshore, and when you do venture deep the competition is not so heavy.